We had a question this week from Tamara who said… “Hi Divas (and help! ), I have a large master bath and would like to add a bench to the middle of the room. 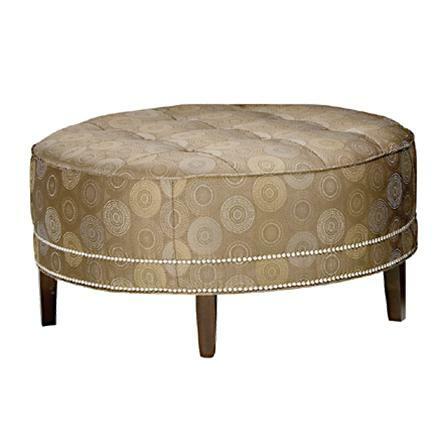 I am looking for one of those round/circular upholstered benches, often seen in upscale boutiques. 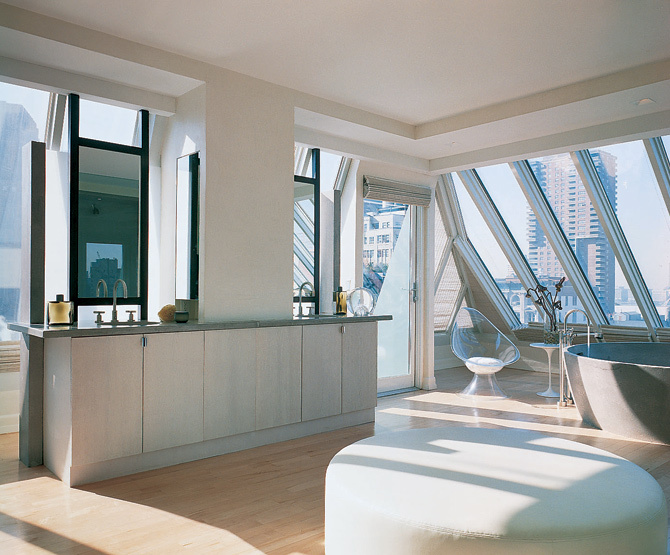 Can you tell me the “official” name for this type of furniture? Well, Tamara, I have to admit that you got me thinking…what immediately came to mind was oversized ottoman, but I thought maybe there was another name. After some digging, I’m sticking with that unless someone else comes up with something else 🙂 Since you brought the topic up, I figured it would be a good subject to Dish About – thanks for the inspiration! 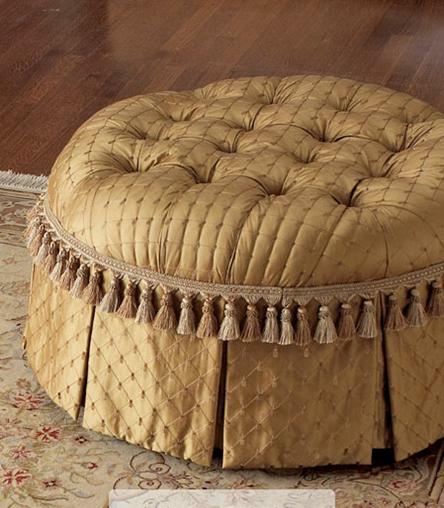 Ottomans come in all kinds of sizes from smaller one’s that are in the range of 12-24″ wide to those that are larger and can be 49″ or more in diameter or length. You’ll find that there is a cross over between what some people call a bench or ottoman and often, either term can be correct. 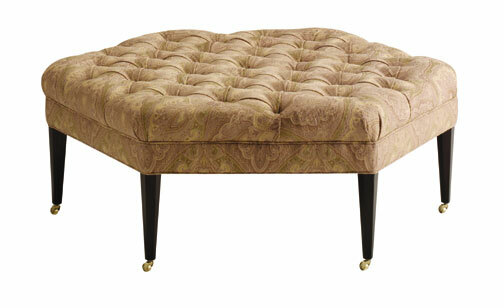 If round, the proper term is ottoman, but if long and rectangular you could probably call it either. If it’s not upholstered, it’s a bench. Bench A long seat, often without a back, for two or more persons. 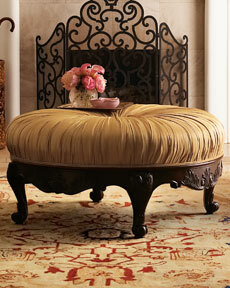 Ottomans have so many uses. They can be paired with a chair for resting your feet, placed with a sofa to be used as a combination footrest/coffee table and can even provide storage for games or quilts. Tuck one or two under a sofa table and pull out for extra guests, add one in your bedroom at the end of your bed and if you have space in a bathroom they are perfect to stand alone or tuck in a corner to add warmth and style. Tamara had specifically asked about an oversized ottoman because she is lucky enough to have room in her oversized bath. Add a crystal chandelier, area rug, beautiful art, candles and some bubbles; you’ll be sure to have a beautifully luxurious bathroom you won’t want to leave! 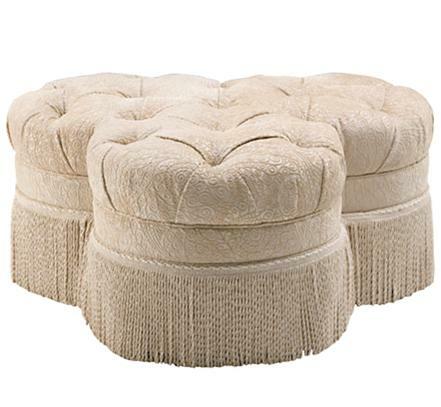 Here are some ottomans that Jayne and I found that may work for you! Let us know what you end up getting – we’d love to see pictures! I saw this quote today and it would have perfect to go with my post a few weeks ago about Beauty is in the Eye of the Beholder. Sometimes I think it’s so easy to get caught up in creating the “perfect” room, that sometimes we forget to add what we love – but the reality is that it’s the things we love that make our house a place we want to be and in the end- make our house a home. One of my most vivid memories as a child was visiting my grandmother’s house on Sundays. She made the best homemade applesauce, but the one item that I adored even more was this clock. Regardless of my style, it always have a place in my home and continues to be the source of good conversation and wonderful memories. After all, isn’t that what it’s all about?